This customer in Fairview came to us because they have a well that supplies 5 homes in the small community. Some residents were having issues with leaks in the plumbing because the pH was low. 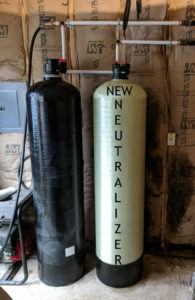 They already had a In/Out neutralizer (black tank) in place, but it was not raising the pH above 7 as it should. We installed a second tank and re-plumbed the first tank, so it would benefit the residents the most. Now, the pH is 7+. Perfect! Call the office to start the process to improve your water today!